Water can be complex, especially when viewed from an insurance lens. This may be why so many questions are raised when evaluating a claim for damage caused by water. Is there coverage? What is the deductible? Should I have purchased special coverage or higher limits? We hope the following examples will help to answer these and other questions, and help you to better understand the complexities of water losses. A couple arrives at their weekend ski lodge to find that it is “raining” inside the home. They had maintained the heat and had a caretaker check on the home, but the temperatures in the area had hit record lows. A water pipe had burst. The basement had to be completely gutted. The main floor had severe buckling to the hardwood floors. Worse yet, so much water had seeped outside of the home, the soil had to be tested to ensure that the home’s foundation and driveway had not been compromised. Property damage totals exceeded $175,000, with another $75,000 in damaged contents. Damage caused by frozen pipes is typically covered under the homeowners policy. However, certain stipulations must be met for coverage to apply. Reasonable care is expected, maintaining heat in the home when not occupied, or by shutting off the main water draining the lines to prevent the freezing of pipes. If this stipulation is not met, a claim could be denied. Homes which sit vacant and unoccupied for 60 days or more, may be excluded from coverage for water damage caused by frozen pipes. During a heavy rainstorm, the Smith’s sump pump failed. Water backed up into their finished basement causing $20,000 in property damage and the clean up of water borne materials. Many home insurance contracts exclude losses caused by water back up. For an additional annual premium, coverage can be purchased by endorsement, at a limit that matches your unique coverage needs. Apartment dwellers and homes without basements are not immune from the risk of water back up. Water could back up from a shower or toilet causing damage to personal possessions. In August 2017, Hurricane Harvey struck the Texas coast, causing more than $11 Billion in residential flood losses. Less than 20% of the affected homeowner had flood insurance. The homeowner insurance contract excludes loss by flood. To ensure your home is protected against losses caused by flood, a separate flood insurance policy must be purchased. All homes are located in a flood zone. Homes located in low risk flood zones (B, C or X), can purchase coverage for less than $500 yr. The flood insurance contract comes with coverage limitations. Your insurance professional can review these with you. FEMA assistance is not insurance, it is a low interest loan you must pay back. The water filtration system under a sink sprung a leak while the homeowners were sleeping, causing damage to the first floor of their home. The repairs took six months to complete, during which they had tp live in a temporary home. When the owners returned, they discovered black mold in an undamaged section of their home. The total mold loss was over $50,000. In most cases, the homeowner insurance contract provides limited coverage for mold remediation, when caused from a covered peril, such as water from a burst pipe. Review your homeowner contract and know your mold remediation limit, typically $10,000 or less. Increased limits may be available for purchase. You have options to protect yourself and minimize damage caused by water. Water leak detection systems sense abnormal increases in water flow and will automatically shut off the water to your home. Some systems can be wired into your central alarm, notifying you when a leak has been detected. 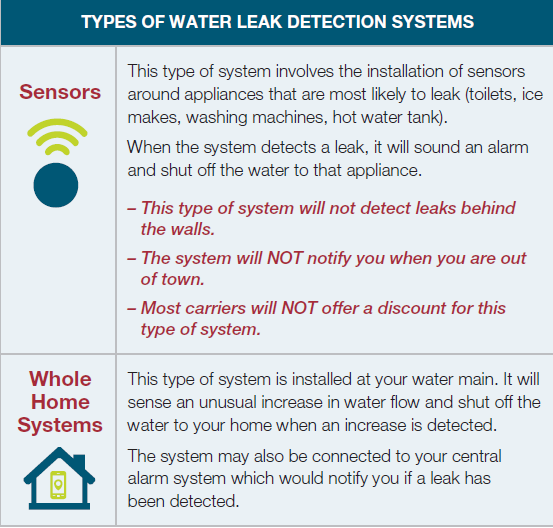 Many insurance carriers offer reduced premiums for homes with leak detection systems. Some even have partnerships with water leak detection companies, extending discounts to you for the cost of the system. Contact your insurance professional to see if your insurance carrier offers these benefits.